Maybe that last part isn't exactly simple. Yet somehow it feels right to Silla Kennicott. And nothing in her life has felt remotely right since her parents' horrific deaths. She's willing to do anything to uncover the truth about her family—even try a few spells from the mysterious book that arrived on her doorstep ... and spill some blood. The book isn't the only recent arrival in Silla's life. There's Nick Pardee, the new guy next door who may have seen Silla casting a spell. She's not sure what he saw and is afraid to find out. But as they spend more time together, Silla realizes this may not be Nick's first encounter with Blood Magic. Brought together by a combination of fate and chemistry, Silla and Nick can't deny their attraction. And they can't ignore the dark presence lurking nearby—waiting to reclaim the book and all its power. 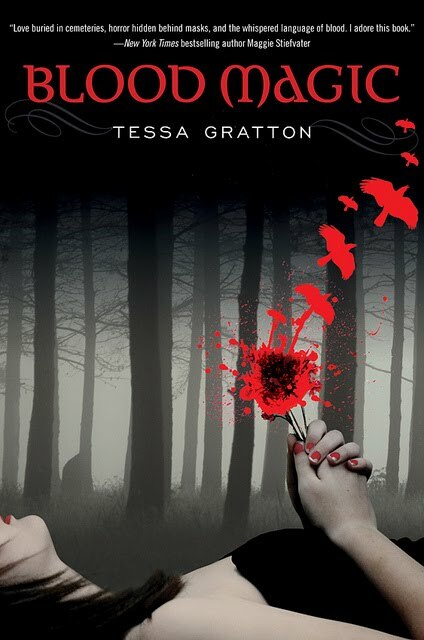 Tessa Gratton's intoxicating first novel will keep pulses racing, minds reeling, and pages turning right up to the very last drop of blood. 1. (+) Silla, the protagonist - She's the girl who everyone thinks is crazy because she found her father and mother dead after her dad killed her mom & then himself. She stays strong though and her grief is real. She loves to perform, and I enjoyed how Ms. Gratton took that aspect of her personality and put it into her world-building and the dark magic of the book with masks and the idea of Silla's guardedness. 2. (+) Brother/Sister Dynamic - Reese is Silla's brother and while they have handled their grief in different ways, the magic unites them in this incredibly tangible manner. Reese is the hesitant one, the one who hates their father, but his love for his sister, bumblebee as he calls her, saves him, I think, from going over the edge. And together, they start a journey to discover who their father really was in the form of this old-fashioned book a mysterious Deacon sends them. Beautiful & poignant. 3. (+) The Romance - Desperate. I mean you alternate between Silla and Nick's perspective and see the way they immediately are taken with each other... but it's not like they're dependent on each other. It's more that they're desperate for answers, desperate to know who they are, desperate to feel alive again through the blood magic... and through each other. 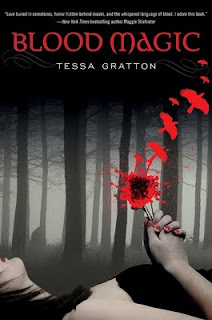 I liked the way Ms. Gratton mixed the romance with the feel of the fantasy world she created. 4. (+) The Addiction - Not to sound corny, but the magic calls to them... Here's a passage from page 86 that I thought was particularly good at mixing this with grief. "... Last semester, I'd had no trouble at all inviting people to chat, or dance. Talking to my classmates and rambling about teachers, boys, plays, and music were things I enjoyed. Now... it felt fake. Like it could fall apart at any moment. Only the blood was real. // I licked my lips. They were dry and cold." It's so real to think that while Silla's exploring for answers & for her own acceptance of what happened to her parents, she would get caught up in this world where anything seems possible. 5. (+) The Writing - Ms. Gratton chose to alternate between Nick and Silla and the past & the present. I enjoyed reading from both of these character's (haunted) perspectives and seeing how the diary entries related to the story and slowly became incorporated into the present and the characters' realization of themselves and their struggles. 6. (+) World-Building - Protection runes. Possession. Making dead leaves come alive. Kissing, opening a wound, and then having a fountain of alive leaves around them. Carmot & the idea of immortality. Just as the characters find out about the possibilities of the Blood magic, so do we as readers, and in my opinion, it worked brilliantly, never having too much come out at once. 7. (--) The font - This is a really specific complaint, but I hated the fonts they used for the diary entries. They were simply hard to read, and while I understand that they wanted to make it seem like authentic handwriting, there are better choices than the ones printed in Blood Magic. 8. (+) Pacing - This book was easy to read. It flowed from page to page -- even with the diary entries, there were times when a concept was introduced and then the characters were exploring it in the present. I'd only say that it got a tad slow between when one of the major events occurs and the aftermath of the event, but it's necessary for the emotional struggle Silla and Nick undergo at that point in the story. It's worth it to continue onwards though. 9. (+) The Villain - Admittedly, I predicted who the villain was... but definitely not what was going to happen next. And the best part was that the villain isn't a storybook villain. Yes, there's still the plotting and whatnot, but the addiction was what got me. The need for immortality. It was creepy and authentic. 10. (--) The Cover - Honestly I think this cover is a tad childish. I know that's strange to say with the blood splattered flower and crows and the dark forest, but the girl holding them reminded me of an anime character. This book is delightful, and I feel like the cover doesn't quite capture that. This is a book you don't want to miss. Blood Magic takes the concept of witches and magic to a whole new level in a world where nothing is what it seems and the grief is palpable in every action the characters take to understand their past and future. Dark fantasy at its best. This book is my fifth in the #30book30days challenge, but due to personal issues, I don't think I will be able to continue for much longer. Here is a list of books I planned on reviewing. I will still review some, but it will be more gradual. I was trying to bite off more than I could chew. This looks SO good! And the cover is stunning. I love the covers. Fantastic review! This book was the perfect amount of creep and fear, action and suspense. Plus it had amazing characters and an awesome plot. I loved it. Love that you loved it. Thanks for the review!